Acutely authentic northeastern Thai cookery finds a no-frills home at this King Street canteen. This no-nonsense Hammersmith establishment feels a bit like a scruffy canteen. Ageing padded metal chairs look like cast-offs from a convention centre; tables are arranged in long lines, and some wobble. From the back of the two-tone pink dining room, portraits of the Thai royal family watch over proceedings. 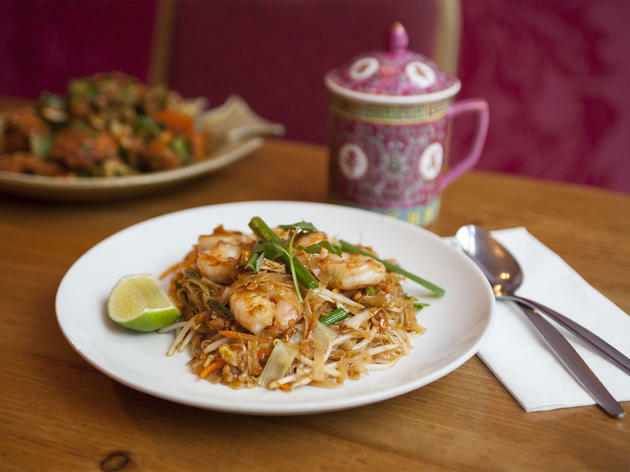 As is the case in many of London’s most authentic Thai restaurants, the cooking here is largely from the Esarn region of north-eastern Thailand – including multiple versions of green papaya salad, accompanied by anything from salted duck egg to sausage. You’ll also find a collection of southern Thai dishes such as sour prawn curry, or turmeric-marinated sea bass. These are prepared by ‘Auntie Bee’ who hails from Hat Yai, a city near the border with Malaysia. An Esarn classic of shredded bamboo shoots with the fermented fish sauce favoured in the region was characteristically pungent (in taste and aroma), served with a decent squeeze of lime, plenty of chilli and a few mint leaves to add freshness. Staff don’t stand on ceremony here, informing diners when the table must be vacated for the next sitting, yet they’re not unfriendly; locals, spanning every age group, are treated with congeniality. Having grown up in South East Asia, my palate is used to the richness of spices and chilli. Many Thai restaurants in London are not generous with the herbs/spices but This restaurant is an exception. The simple decor and simple pink restaurant sign mask the authenticity of the food here. They are generous with spices and chilli, just like how they do it in Thailand. 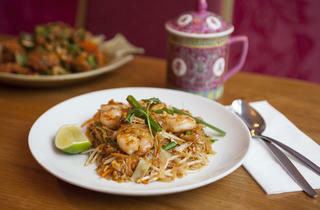 Their menu is extensive and some are not commonly found in other Thai restaurants in London. I highly recommend the spicy papaya salad. The £6 lunch deal is good value for this area. The best Thai in London! Feels like you're in Thailand! Authentic and delicious. Great value and taste! Friendly family restaurant, great food, very cheap and amazing quality! I've been a couple of times recently.....the food is tasted authentic and rarely fails, and I'm terribly fussy about such things....service could be more attentive but never spoiled the experience for me. The sour pork rib soup is a high point...along with sea bass sour orange curry (gaeng som bplaa). This is the real thing. Always full of Thais. If you close your eyes, you could be eating in Bangkok. It's not fancy or posh, but the prices are great. My kids love it too.